Recently, director of EnviroDesign Management Randy Holland gave a presentation to the San Antonio chapter of the American Backflow Prevention Association. 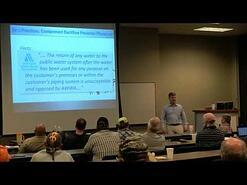 The presentation was recorded and you can now watch it and learn about backflow prevention best practices. This is the second video in a three part series. Here is a link to find the first video on cross connection control industry changes and you can check back soon for a link to the third video on backflow installation in vaults. Here is an excerpt of this 14 minute video: You should know that there is no guideline in either the UPC or the IPC plumbing code that says you should ever worry about putting a drain under an RPZ larger than four inches. Here's what the ASPE plumbing engineering design handbook says "Before an RPZ is located, consideration should be given to both how much water will be discharged and where it will drain. Consideration must be given to the drain system to ensure the drainage system can handle the load. If the drain is not capable of accepting the flow other choices as the location of the valve, such as outside, should be made." Watch the video below to learn more about these risks associated with indoor RPZ backflow preventer installation. You can also download the companion guide that covers this and other topics by clicking the link below.